These are from PRAS. They’re called “Comfy Loafers”. 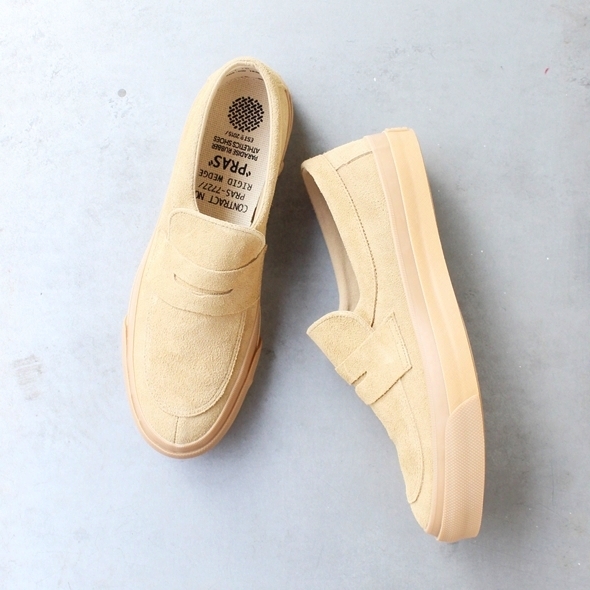 They’re made in Kurume, Japan, the home of quality vulcanized rubbery footwear. What I like about these is that they perform the task of a loafer: slimmer form, a little ‘dressy’; yet, by virtue of their construction, they avoid the clip-cloppy, leather-sole shenanigans of your standard slip-on. As much as I see wide-legged trousers accessorised with dainty, traditional loafers on Japanese Instagrams (Nepenthes being a prime example) for me, right now, it feels a bit too clownish. Give it a month or two and I might change my mind, I can only report on the facts as they stand. Anyway, I can see these working when the national conversation switches from moaning about frozen windscreen wipers, to moaning about the lack of air-con in the average British workplace. That solid sneaker sole will easily offset a cuffed, wider hemmed trouser. And would look okay with shorts I guess, although, I’d definitely keep socks in the mix. Just don’t take that ‘Penny Loafer’ thing literally and wedge a penny in the hole up front. I dare say GQ thinks its cool. But it’s not. It’s the quickest way to turn a decent looking pair of loafers into a carnival of piss.